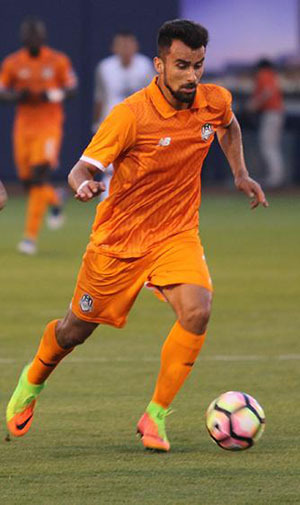 The Tulsa Roughnecks FC faced Sacramento Republic on Saturday night in the hopes of getting their second win of the 2017 USL season but fell short by a goal. After the two clubs battled to a scoreless tie in the first 45 minutes, Sacramento found the back of the Tulsa net behind goalkeeper Bryan Byars in the 49th minute when former TRFC forward Sammy Ochoa found a wide open Wilson Kneeshaw who used the outside part of his right foot to leave Byars with no chance as Sacramento took the 1-0 lead. Ochoa played a part in Sacramento’s second mark when he fired a shot on Byars that he initially saved, but Tyler Blackwood tapped the ball in when the rebound rolled to him. The 2-nil lead was cut in half in the 80th minute when Joey Calistri gathered up a rebound of a Brady Ballew shot off the goal post and blasted the ball past Sacramento goalie Dominic Jakubek to give the home side their only goal of the night. Two good chances proved fruitless down the game’s final stretch. For the next 10 minutes, the Roughnecks appeared destined to find an equalizer, but chance after chance came up empty. One of the best opportunities came in the 87th minute when Caffa’s corner found a wide open Jorge Corrales at the back post, but the defender’s left-footed shot skied over the crossbar. Three minutes into stoppage time, it looked like Mata might produce an equalizer. Joaquin Rivas’ cross set up an unmarked Mata at the penalty spot, but his side-footed shot rolled harmlessly past the post. Despite the disappointing outcome Roughnecks head coach David Vaudreuil was pleased with his club’s performance during the match. From here the Roughnecks take to the road for two games, the first coming up in two weeks when they head to Edinburg, Texas on April 22nd to take on the RGV Toros, who the Roughnecks defeated last week 1-0. Then it’s north to Colorado Springs for a rematch with the Switchbacks on April 28th, who by default defeated the Roughnecks 3-0 on opening night at ONEOK Field after the 4-1 victory recorded by Tulsa was wiped out by the USL after it was discovered that there was an ineligible player on the Roughnecks roster. The next match at ONEOK Field is on May 11th when the Roughnecks host Vancouver Whitecaps 2.